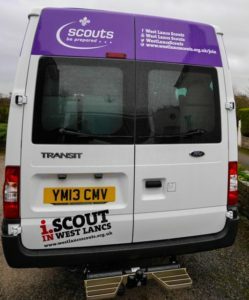 Aimed primarily at supporting WestLancsScouts’ extensive adventure and overseas programme, but after that it will be available for other County/District/Group activities at weekends and during school holidays. 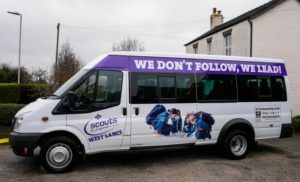 The running costs are being shared with the Lancashire Wildlife Trust who will use it five days a week for their educational programme, term time only. Thus it becomes impractical for WLS to use it in the evenings during term time. 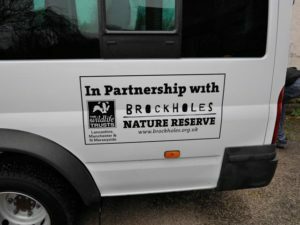 When not in use it will be kept in the secure administration compound at the Brockholes Nature Reserve. 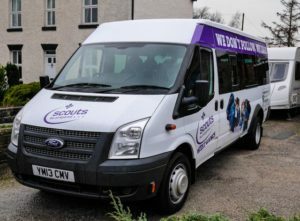 As it has been converted for disabled use, and is under 4.25 Maximum Authorised Mass, it is driveable in the UK by anyone over 25, and under 70, with two years driving experience. The usage fee is £50 per day, or part day, plus fuel. We don’t usually book it out for single days at a weekend. So a weekend’s use is from 4pm Friday to 9am Monday and will cost the event £120 plus fuel.